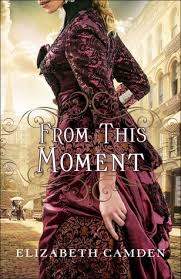 Today’s Mystery Monday book is From This Moment, Elizabeth Camden’s latest release. Written about the 19th Century, it is a departure from the books I usually discuss. I was so touched by the story and characters, I wanted to share it with you. Stella West is an accomplished artist who takes London by storm. When her sister dies under suspicious circumstances, Stella rushes back to Boston to solve the mystery. Romulus White publishes the world-famous magazine, Scientific World. The well-connected, “most eligible bachelor” rubs elbows with Boston’s elite. He’s just the sort of person who can open doors for Stella as she investigates her sister’s death. I have read all of Elizabeth Camden’s books, and by far, this is my favorite. Meticulously researched, the story blends fact with fiction during Boston’s project to install a subway system beneath their streets. I feel in love with Stella and Romulus immediately. Stella is highly intelligent, articulate, strong-willed, and a bit overbearing, but because she is so grief-stricken her behavior is understandable. Romulus is a charming mixture of fashion guru, roguishness, and insecurities. He’s the perfect foil for Stella. As always when I read one of Ms. Camden’s books, I was disappointed with it ended, and her characters have stayed with me long after I turned the last page. A must read.